The Big Cheese Family is a book of battle between mice and man. It is an amusing tale that children will find humorous and entertaining. It contains cartoon illustrations that have a pencil drawn look that children will be able to relate to. This is book 1 “Not’cho Cheese!” in a series. This book had me wondering why in many ways. Why are there so many blank pages at the front, with some being the yellow of the whole book but a few being white? There are also two white blank pages at the back. It is as though a few extra sheets got thrown in when putting the book together, but these sheets are yellow and white not fully yellow. I also questioned the use of yellow pages but this is consistent with the colour that Tony Jerris likes in his books as his first book The Little Spruce is printed on red paper. The illustrations also had me baffled, some filling the frame, the others falling short leaving them looking unfinished. ‘They are a cheese-loving family of mice that live in a grocery store, giving them free range to the dairy section. There’s only one problem standing in their way - Mr McGrime, the cranky store owner. Still, that doesn’t stop the playful critters, who somehow always outsmart Mr McGrime. Written in metered poetry, this series of books will take kids on a fun-filled romp with each new story. In Book1 -”Not’cho Cheese!” - Grandpa Gouda pays a visit to Papa Parmesan, Papa’s wife, Brie and their son, Reggiano. But when Reggiano eats the macaroni-and-cheese that Brie’s prepared for dinner, the mice must figure out a way of sneaking cheese from the grocery store and into their nook without being caught by Mr McGrime. 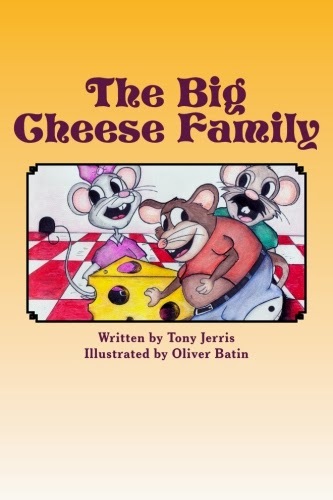 The Big Cheese Family has a great story plot with humor thrown in. I loved the use of cheese names such as Parmesan and Brie for the mouse family. Placing a cheese glossary at the end of the book adds a little educational value to a fiction book and extends the interest in the subject at hand. Tony Jerris has a great idea but I feel he may have rushed the production process leaving the final product looking as though not much thought had gone in to it. I feel more time could have been spent tightening the story as at times the rhyme misses, making for hard reading and the loss of flow. I would love to see this book republished as the story itself has a lot to offer. Overall The Big Cheese by Tony Jerris is a book that will entertain children, being suitable for the early reader, but probably not a book that they will come back to time and time again.